Did you know that Doctor Who was first aired on the BBC on November 23, 1963? Check out this wikipedia entry for far too much information about the Doctor and his various friends and enemas, sorry, enemies. Only the day before, November 22, U.S. President John F. Kennedy was assassinated by Lee Harvey Oswald in Dallas, Texas. And on November 24, a day after Dr Who premiered, Oswald was shot to death by Jack Ruby, a Dallas nightclub owner. Check this wikipedia entry for oodles of information about JFK and his life and times, and death. Who knew that Dr Who, along with his TARDIS, would outlive the whole darn lot of them? But then, he is a time lord. Love and mystery from Dr On Mars. 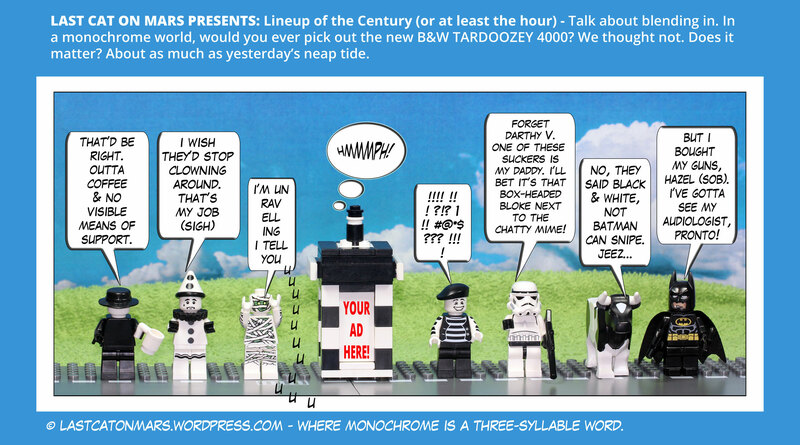 This entry was posted in Space, Variety Show and tagged Dr Who, lego, lineup, minifigures, Tardis, TARDOOZEY on January 29, 2016 by Jay Verney. They were feeling left out in this season of Forcefully Awakened Force Thingys, so Dr On Mars decided to even up the keel, so to speak. 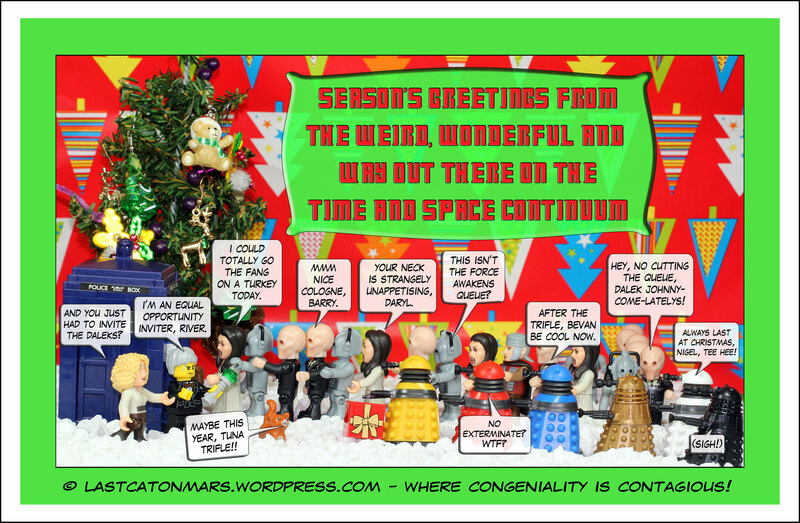 Have a Happy Festive and Minty Fresh Season of Jollity, Troopers and other Weird Lovelys! Love from the Martians. 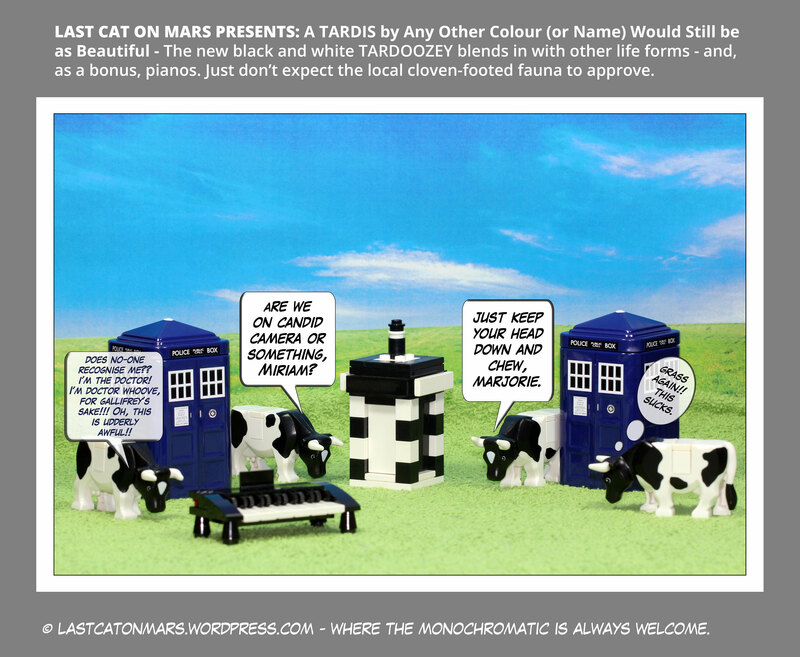 This entry was posted in Special Occasions and tagged Christmas 2015, Cybermen, Daleks, Dr on Mars, Dr Who, Last Cat, lego, minifigures, River Song, Tardis, The Silence, Vampires in Venice on December 25, 2015 by Jay Verney. 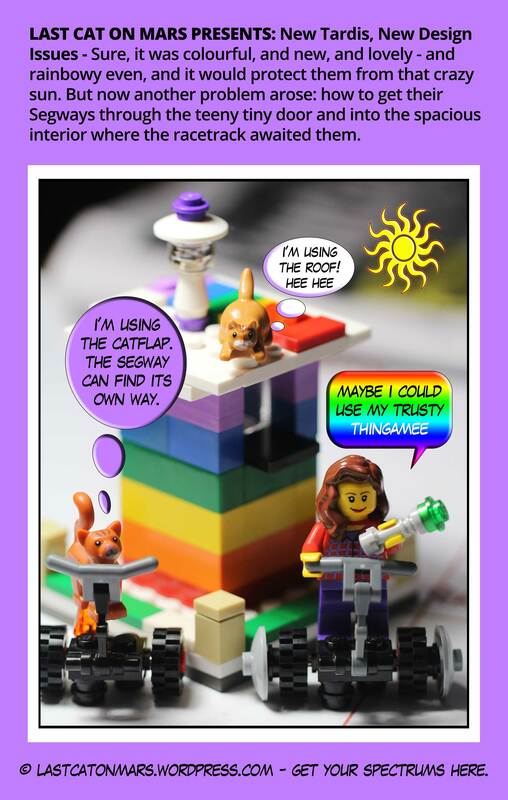 This entry was posted in Space, Variety Show and tagged cartoon, cats, comic, Dr on Mars, kittens, lego, minifigures, rainbow, rainbow Tardis, Segway, Tardis on August 12, 2015 by Jay Verney.